If you like to get out and about on the weekends, there are some really great events you might want to plug into. SATURDAY afternoon, women and those who identify as women are invited to join the Ovarian Psyco-Cycles on their third annual Clitoral Mass ride. The first ride, held in 2012, generated some controversy for excluding men. But, the organizers held fast to their stance, arguing that group rides did not always feel like safe spaces for women and, in particular, women of color or those whose who identified as women. The women seemed to agree, as they came out in droves — more than two hundred showed up for the first ride. The Ovas are at it again, with a day ride this year. Meeting up at Grand Park (200 N. Grand Ave.) at 1 p.m. and rolling out at 1:30 p.m., they will take those identifying as women on a 30-35 mile tour of the city, and have a number of pit stops planned to invigorate and educate riders. People’s Yoga will prepare riders for the tour with a stretch session, Buyepongo will lead a drum circle, Comida no Bombas will provide dinner in Echo Park, activists will discuss gentrification at a stop at Mariachi Plaza, and a support car (with mechanics) will follow the riders. There will also be a condom mobile and lots of free snacks and water. The tour will end where it began, in Grand Park. For more information about the ride, see a previous article about the ride planning here, or visit their event page, here. If you are not woman-identified or just feel like stuffing your face instead, head over to the L.A. Taco Festival in Mariachi Plaza from 2 – 8 p.m. on Saturday. The event is a fundraiser for Jovenes, Inc., one of the very few organizations in L.A. that provides housing and support to homeless youth. 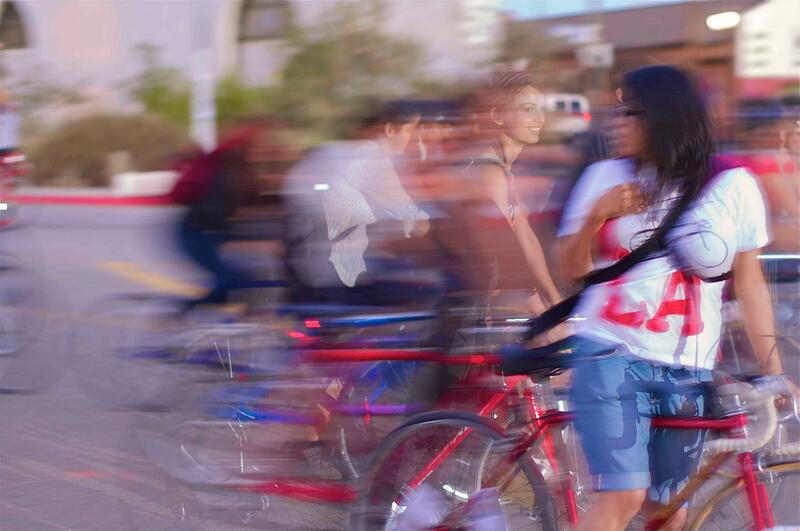 You may remember the Boyle Heights-based Jovenes as one of the recipients of donated bikes we wrote about at the end of last year. Thanks to the generosity of the LACBC and an Eagle Scout named Diego Binatena, Jovenes was able to set up an in-house bikeshare program that helps its youth experience greater freedom of mobility. We’ll be checking in on how the program is doing in the next few weeks. In the meanwhile, you can support their work by joining the festivities, listening to a great line-up of music, and eating yummy food. More about the event and pricing for taco tickets can be found here. SUNDAY morning, you can get in on a unique adventure in unity that will take you from Little Tokyo to Watts and back. Join the Asian and Pacific Islander Obesity Prevention Alliance (APIOPA), Community Health Councils, Trust South L.A., the United Riders of South L.A., the East Side Riders, the Southeast Bicycle Alliance, Los Ryderz and the East Side Riders BC for a Unity Ride of different cultures. The ride will start at the Japanese American National Museum and work its way down historic Central Ave. to stops at Augustus Hawkins Natural Park, the Watts Towers, the Watts Labor Community Action Committee, and, eventually, back to the Japanese American National Museum. The ride is approximately 22 miles. But, if you’re pooped at the half-way point, you can always jump on the Blue Line (two stations are just blocks from there) and head right back up to downtown. Meet at the museum in Little Tokyo (100 N. Central Ave.) at 10 a.m. Please note that Sunday marks the end of the wonderful Nisei Week celebrations, so be sure to ride or take Metro to the museum to avoid parking hassles. If you to prefer to brunch your way through Sunday morning, join community and arts collective Corazon del Pueblo for eggs, potatoes, beans, and fruit from 10 a.m. to 2 p.m., at 2003 E. 1st St.
Because Corazon del Pueblo functions as a community space and is volunteer-run, they have struggled to keep pace with rising rents along 1st St. They held an emergency fundraiser in December, but are again finding themselves coming up short over the summer. Given that there are so few spaces in or near Boyle Heights that celebrate the community and give them space to have a voice through men’s and women’s talking circles, spoken word nights, art jams, music classes, and health and fitness workshops, the loss of the spot would be a real blow to the community. Find out more about Corazon, here, and the fundraiser/brunch event, here. L.A. Clitoral Mass sounds great – I think my wife and maybe daughter will do the ride this year! I bristle a little, though, at reading that the first Clitoral Mass was 2012. The first L.A. Clitoral Mass was 2012 – but I seem to remember hearing about bike rides under that name taking place in San Francisco some time around the late 1990s. I just googled a bit and I couldn’t find any evidence of this, so maybe I’m mistaken. Anyone out there know about early Clitoral Mass rides? You can’t go on the ride, Joe. It’s for women only, no? South L.A. to Pasadena: The 2nd Clitoral Mass Takes Over Streets of L.A.